A firefighter covers his eyes as he walks past a burning hillside in Santa Rosa, Calif., Oct. 9, 2017. Wildfires whipped by powerful winds swept through Northern California, sending residents on a headlong flight to safety through smoke and flames as homes burned. Donations and volunteers are needed in Northern California as local fire crews battle multiple blazes that have wiped out entire neighborhoods and killed dozens of people. The fires have ravaged Sonoma, Napa, Solano, Mendocino, Yuba and Lake counties, destroying at least 5,700 homes and businesses. At one point, 100,000 people had to evacuate. Officials have confirmed at least 42 fatalities. Many of those forced to evacuate will return to their homes only to find ash and charred wreckage. Below is information on how you can help recovery efforts. Some information is for people who live in the area, but there are also national campaigns dedicated to fire relief. For tips on how to avoid charity scams, visit here. This page will be updated. You can also stay current as needs change by visiting the social media pages of affected counties. Petaluma officials have shared a Google doc with information on volunteer opportunities and other ways you can help. As of Oct. 10, Petaluma's shelters were no longer accepting donations of goods. The city of Sonoma said Sunday, Oct. 14, that its evacuation center at Sonoma High will close Monday at 6 p.m. All school-based centers are also closing and evacuees are being transfered to Red Cross-operated shelters. For opportunities to volunteer in Sonoma County, email info@volunteernow.org or call (707) 573-3399. The city of Santa Rosa said Monday, Oct. 16, that people can still make unprepared food donations to homeless shelters. Visit St. Vincent de Paul at 610 Wilson Street, from 8 a.m. to 3 p.m. or the Redwood Empire Food Bank at 3990 Brickway Blvd. from 8 a.m. to 8 p.m. No more donations of food or goods are needed at local evacuation shelters or fire and police departments. Catholic Charities of Santa Rosa is also accepting food donations and you can call 707-528-8712 for information. The Salvation Army is accepting clothes and supplies at 93 Stony Point Circle. For more information, call (707)542-0981. The city of Santa Rosa has also urged people to donate to the United Way of Wine Country's Relief Fund or a North Bay Fire Relief campaign organized by Redwood Credit Union. The Ukiah Daily Journal has posted resources for donating or volunteering in Mendocino County. The North Coast Opportunities Volunteer Network can be reached at 707-462-1959. The Savings Bank of Mendocino is accepting donations in response to the fires in Mendocino County and Lake County. You can mail them to P.O. Box 3600, Ukiah, CA 95482 or pay online here. The city of Napa said Tuesday that no volunteers or in-kind donations were needed - that means no clothes, no toiletries, and no prepared food. Instead, Board of Supervisors Chairwoman Belia Ramos is asking people to donate money directly to the Napa Valley Community Foundation. Those who want to volunteer should sign up and update a volunteer profile here with the Center for Volunteer and Nonprofit Leadership. Yuba County is accepting donations for evacuees in front of Franklin Hall at the Yuba Sutter Fairgrounds between 9 a.m. and 7 p.m. As of Wednesday, they were in need of socks, hair brushes, shampoo, conditioner, Kleenex, diapers and other toiletries. Footage captured by NBC Bay Area's SkyRanger depicts the widespread devastation caused by wind-driven wildfires that quickly spread across the North Bay. The Red Cross released a statement on Monday afternoon saying that it had met its immediate need for volunteers, but the organization asked interested parties to sign up online for updates, as more people may be needed in the coming days. “As the disaster continues to evolve, the Red Cross will assess how community volunteers can best support the operation,” the non-profit said in a statement Monday. “Those interested in volunteering to support Sonoma, Napa, Lake and Mendocino wildfire relief efforts, can sign up online." People can also donate directly to the Red Cross Disaster Relief at any time by dialing 1-800 RED CROSS. To make a quick, one-time donation of $10, text CAWILDFIRES to 90999. The donation is used to "prepare for, respond to and help people recover from this disaster. "This includes providing food, shelter, relief supplies, emotional support, recovery planning and other assistance as well as supporting the vehicles, warehouses, technology and people that make that help possible," the Red Cross said Thursday. The foundation started its Disaster Relief Fund in 2014 after an earthquake flattened areas of South Napa. 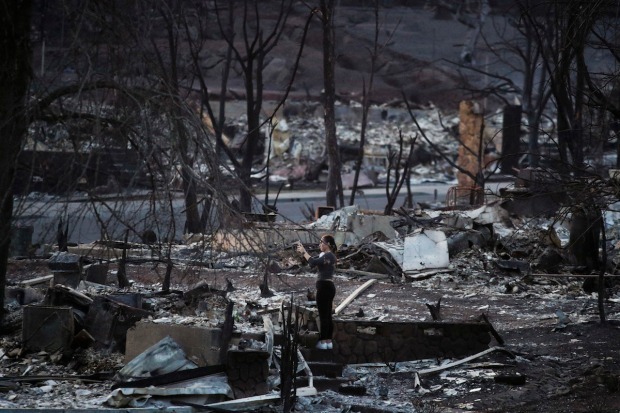 Now, it'll be mobilizing the same network for fire victims. In addition to distributing immediate grants to smaller, local nonprofits, the foundation says it will work with government agencies to identify recovery areas that need the most assistance. You can donate online and by snail mail. Click here for more information. The Community Foundation of Sonoma County launched a Resilience Fund to help with the mid- to long-term needs of Sonoma recovery. Facebook, which announced on Tuesday a $1 million pledge to fire relief efforts, has donated $250,000 to the fund. You can donate or find out more here. The Rotary of Sonoma Valley will match the first $10,000 of donations on its YouCaring page. The Sonoma County Grape Growers Foundation has partnered with the Sonoma County Farm Bureau in establishing a fund to help ag workers and their families who lost homes in the fires. GoFundMe has verified this donation page, created by winery owner Jake Kloberdanz, for general fire relief. There are also dozens of donation pages set up for individual people and families affected by the fire. All donations under the "California Fire Relief" section are backed by GoFundMe's guarantee policy. The City of Santa Rosa also set up a YouCaring page to assist Tubbs Fire Victims. A slew of Bay Area sports teams, including the San Francisco 49ers and the Golden State Warriors, pledged $450,000 on a YouCaring page and have invited fans to contribute. Meanwhile, cannabis enthusiasts have started a donation page for marijuana growers who lost their farms in the blaze. Note: GoFundMe collects 5 percent of the total amount raised and there is a transaction charge for each donation. YouCaring charges a transaction fee but does not collect a percentage of the total donation. Airbnb has activated its Open Homes program for the North Bay. The program, established in 2012, allows hosts to open up their homes for free to people needing shelter. The company released a statement saying it was in need of more hosts to volunteer. Find out more here. Tech workers in San Francisco also started a Google Doc to connect evacuees with housing assistance. If you have space in your home and would welcome evacuees, you're invited to add your name to the list. SHARE Sonoma County is arranging emergency home shares for displaced homeowners or renters in Sonoma County. Those willing to host a person or family for anywhere from days to months should contact PPSC SHARE Sonoma County at SHAREfire@petalumapeople.org. Volunteers to help with phones can visit the Petaluma People Services Center at 1500 Petaluma Blvd., South, Petaluma. Milo Foundation, a long-running animal rescue group with headquarters in Point Richmond, was forced to evacuate about 200 animals from its sanctuary in Willits. Shelter staff are asking people who live in safe locations to open their homes to shelter dogs and cats as a result. Sonoma County Animal Services, as of Oct. 14, was no longer in need of food or other supplies for animals. They have set up a 24/7 phone line for information and donations at 707-565-4648. You can also donate here. Those interested in fostering animals can visit here. The SPCA of Solano County, as of Wednesday, was in need of cat food, kitty litter, blankets, towels, beds, leashes and cleaning supplies. You can also donate here. Peet's customers can make digital or cash donations for its North Bay Fire Relief Campaign through Oct. 22 at any of its coffee bars around the country. The Bay Area-based company will match funds of up to $10,000 to be distributed to: Community Foundation of Sonoma County, Napa Valley Community Foundation, The Community Foundation of Mendocino County, and other non-profits and food banks. The Redwood Empire Food Bank said it delivered the equivalent of 110,000 meals to Sonoma County evacuation centers, as of Tuesday evening. You can make a financial donation here. Give Lively's wildfire relief page, which offers ways to donate to several community organizations, lets you send money now or schedule the gift for later. Love on Haight, a vintage clothing shop in San Francisco, posted on Facebook that it was accepting clothing donations and had a limited number of available shelters for evacuees. The clothing store has also set up a donation table outside for people to drop off clothing donations. Tutto Capelli Salon in San Carlos is opening a donation drive. Owner Gina Hawk said she is collecting pet supplies, phone chargers, baby supplies, feminine products, and other toiletries to bring to shelters. Salute E Vita Restaurante in Richmond: The staff at the Marina Bay restaurant will be driving up and donating goods twice a day. Organizer Jamie Dooley is encouraging people to bring non-perishable goods, socks, blankets and pillows along with other essentials. "As a Santa Rosa native whose family has been evacuated, it breaks my heart to see my hometown reduced to ashes," Dooley said. "We’re doing everything possible to support our friends and family." Martinez Mobilizes for Santa Rosa: This Sunday, the popular Del Cielo Brewing Co. in Martinez will be hosting an all-day donation drop-off event. You can find out more information about needed donations at the event Facebook page. Seaport Storage Center and Collection 55 Cellars in Redwood City is accepting donations for fire victims. Donations of tents, sleeping bags, pillows, water, personal hygiene products, diapers, can openers, and phone chargers can be made until 4 p.m. daily. The center has large trucks available to drop off goods. Call Justin Wethington at 650-218-6360 if interested. Jewish Community Center in Berkeley (Walnut Street location): The community center will be accepting donations for a massive Thursday drop off. Staff are asking for clothing and toiletries. Please bring donations by 4 p.m.
Oakland 1-2-3-4 Go! Records: The long-running record store in Oakland has posted a list of needed items on its Facebook page (no clothing needed.) Donations will be dropped off in Santa Rosa throughout the week. This post will be updated. Have something to add? Email Gillian.Edevane@NBCuni.com. Check out full coverage of the fires here.